Solar Lentigo is a discomforting condition that temporarily ruins the appearance of skin. Read on to know what is Solar Lentigo as well as its causes, symptoms, diagnosis and treatment. 3 Is Solar Lentigo raised or flat? 8 Is Solar Lentigo Dangerous? It is a dark lesion that arises on the skin surface that is usually caused by artificial or natural ultraviolet (UV) light. 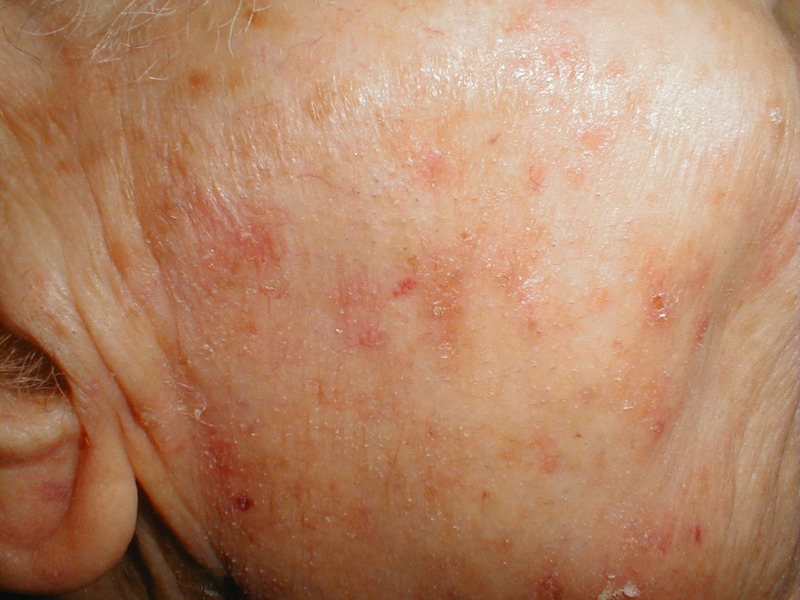 A group of Solar Lentigo rashes are known as Solar Lentigines. 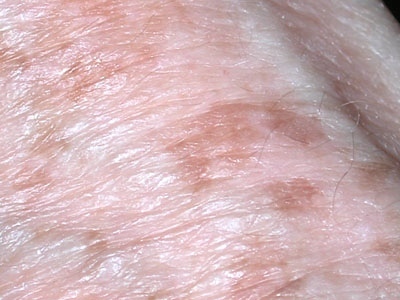 These lesions generally look like dark brown spots over the skin surface. In some cases, they may also be light in appearance. The lesions are non-cancerous. The lesions are generally of a single color and do not have any ragged edges. Solar Lentigo skin spots generally arise in areas like arms, face, hands, neck, on the chest or on the back. Is Solar Lentigo raised or flat? These are not elevated and have a plane appearance. They are generally flat in shape. Prolonged exposure to sun rays is the main cause of this condition. The harmful ultraviolet (UV) rays of the sun can damage the skin and lead to the development of Solar Lentigo lesions on the skin surface. The skin in older people, particularly those beyond the age of 40 years, is less capable of regenerating itself from exposure to sun rays. Ageing is another prime cause of this disease. This syndrome is usually detected by physical observation of the skin. People with this disease are likely to have a paler skin than those who suffer from simple sunburns. In some cases, the detection becomes difficult when the doctor confuses the symptoms with Melanocytic Lesions. A skin biopsy is required in such cases. A sample of the skin is taken and analyzed under microscope in a laboratory for a proper diagnosis. The treatment of Solar Lentigo is possible through Cryotherapy, Laser Rays and freezing. Cryotherapy is an inexpensive way of Solar Lentigo cure and helps in removing spots in people with lighter complexion without leaving any blemish. Laser Therapy, on the other hand, is a costlier option for Solar Lentigo removal. For curing Solar Lentigo Chemical peel method is also used in some cases. In patients of Solar Lentigo Hydroquinone and other bleaching agents have not been found to yield effective results. For solar lentigo topical therapy involves a combined application of Tretinoin and Mequinol. The application of these topical medicines has been found to reduce the dark spots without any noticeable side effects. The Solar Lentigo spots can be faded with the application of non-invasive topical creams like Hydroquinone and Tretinoin cream for several months. Trichloroacetic acid (TCA) is effective in Solar Lentigo removal in individuals with a darker complexion. Apply fresh juice or gel of Aloe Vera on the Solar Lentigo lesions. Doing this two times every day for one or two months to help the dark Solar Lentigo sunspots fade away. Aloe Vera is one of the best Solar Lentigo natural cures. It helps heal burns on the skin and remove dark spots. Mash 1/3 cup of chick peas. Add a little water to the peas and combine well. Apply the mixture over the pots every evening for about a month and leave it undisturbed until it dries completely. Wash this off with cold water at night. Take about 140 mg of Bilberry extract or prepare an extract from 5-9 oz. of fresh berries. Rub your skin with this extract to slow down the ageing process. This will rejuvenate your skin and help it regenerate after exposure to sun. Apply some fresh lemon juice over the spots and rub it in to make the lesions fade away. You must continue this for at least two months to see results. Rub Vitamin E oil over the lesions for two times every day for at least one to two months. This will help the dark spots go away after a time. As aforesaid, this is a benign condition. However, the disease is sometimes seen associated with skin cancer. But cancerous conditions are actually the result of exposure to ultraviolet rays of the sun and not Solar Lentigo development. In patients of Solar Lentigo cancer is not a direct consequence. This condition usually affects people who stay outdoors for a long time in swimwear or low cut tops. This is the reason why many swimmers are often seen to be affected by this condition. These spots usually arise on the chest and back of swimmers. The condition is also common in aged people. Solar Lentigo liver spots are common in people older than 40 years, especially those who spend a lot of time outdoors in bright sunlight. The condition can be prevented by wearing clothes that cover the skin. Wear long-sleeved clothes and trousers with hats that have a wide rim. This will help protect your skin from direct rays of the sun. Use sunscreen before going out into bright outdoors where hot rays of the sun can directly affect your skin. It is even better to avoid exposure to the skin. Carry an umbrella if you really have to venture outside. It will also help if you avoid activities like tanning and engaging in outdoor sports in high summer days. If you are aged over 40 years, it is better to limit your activities under the sun. Are you curious about the appearance of these liver spots? Here are a few Solar Lentigo pics to help you out. Take a look at these Solar Lentigo images and know how these lesions look like. Solar Lentigo is a benign condition that does not lead to any harmful complications. If you are suffering from the condition, use home remedies to cure the condition. If no improvement is seen, get in touch with a dermatologist. Early treatment will help you recover from this condition very soon and get back to your healthier self.